For all your electrical needs give us a call! No job is too is too small. We specialize in residential and light commercial work. Our prices are affordable and we offer a guaranteed warranty on all our services. Don’t take unnecessary risks. Call us and let our trained professionals do it right the first time. License #ER13012515. 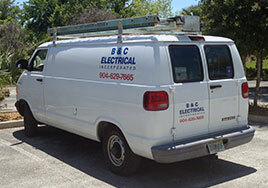 B&C Electrical, Inc. has been doing business in the Duval County and surrounding areas since 2001. Our business is predicated on serving our customers with dependable and professional electrical service. With quality second to none, our customers receive the highest level of electrical service and nothing less.